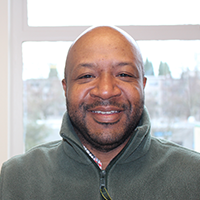 “Kevin brings just the kind of experience and leadership that we need as we grow and evolve to meet the changing needs of our community,” said Jeff Cogen, Impact NW’s Executive Director. Impact NW has experienced remarkable growth in the past several years. Washington joined the $12 million in 2016 to help manage the growth, streamline financial operations and help plan for the future. “Kevin’s variety of experiences make him a great fit for this role,” said Cogen. Washington brings a unique business perspective, having worked as a cost analyst, accountant and controller in the entertainment, healthcare, construction and alternative energy industries and with experience in Hawaii and Japan. Originally from Detroit, Kevin holds a Master’s in Accounting from Walsh College, an MBA from Temple University and a Bachelor’s in Business from Morehouse College. He spent the first part of his career honing his skills in the automotive industry at Ford Motor Company.